The United States places a relatively high burden on long-term capital gains income (gains on assets held for more than one year). The top federal tax rate is 20 percent. In addition, taxpayers with AGI over $200,000 ($250,000 married filing jointly) are subject to the 3.8 percent Net Investment Income Tax. Long-term capital gains are also subject to state and local income taxes. Combined, taxpayers can expect to face a marginal rate as high as 33 percent depending on their state of residency. 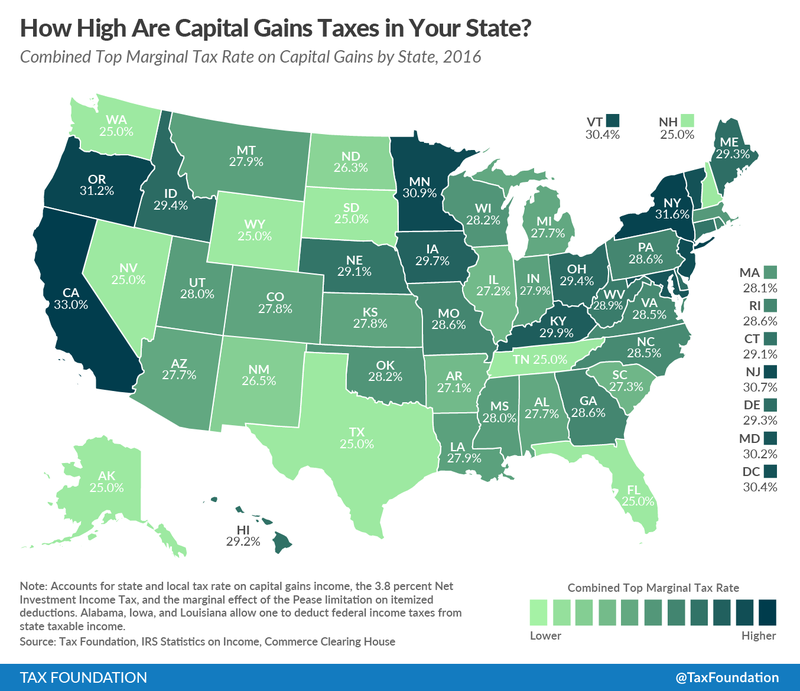 Displayed on the map below is the top marginal tax rate on capital gains income by state. The top marginal tax rate is the combined federal, state, and local rate paid by the taxpayer on capital gains income in the highest tax bracket. It varies nationally due to differences in tax regimes at the state and local levels. At the state level, taxes on investment income vary anywhere from 0 to 13.3 percent. Three states (Alabama, Iowa, and Louisiana) allow taxpayers to deduct federal income tax paid from state taxable income, and others states also treat capital gains income in a special manner. All of these special treatments, any additional tax levied at the state or local level, and the effect of the the prior average of 28.7 percent in 2014. However, taking into account each state’s respective capital gains income, the weighted average rate is 28.9 percent. Breaking this down further, the states with the highest top marginal capital gains tax rates are California (33 percent), New York (31.6 percent), Oregon (31.2 percent), and Minnesota (30.9 percent). The lowest rate of 25 percent is shared among the nine states with no personal income tax (Alaska, Florida, Nevada, New Hampshire, South Dakota, Tennessee, Texas, Washington, and Wyoming).